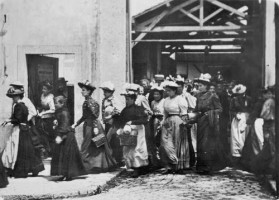 The film Workers Leaving The Lumière Factory In Lyon (La Sortie des Usines Lumière à Lyon, 1895) by the brothers Louis and Auguste Lumière is 45 seconds long and shows the, approximately, 100 workers at a factory for photographic goods in Lyon-Montplaisir leaving through two gates and exiting the frame to both sides. The first camera in the history of cinema was pointed at a factory, but a century later it can be said that film is hardly drawn to the factory and is even repelled by it. Films about work or workers have not become one of the main genres, and the space in front of the factory has remained on the sidelines. Over the last century virtually none of the communication which took place in factories, whether through words, glances, or gestures, was recorded on film. In 1895, the Lumières’ camera was pointed at the factory gates; it is a precursor of today’s many surveillance cameras which automatically and blindly produce an infinite number of pictures in order to safeguard ownership of property. A new archive system is thus on its way, a future library for moving images, in which one can search for and retrieve elements of pictures. We must understand the importance of returning to the purity of the first gaze, and an unreconciled search to find transcendent, enduring meaning behind the transitory, quotidian images. The basis for the chief stylistics of cinema was given in the first film sequence. Signs and symbols are not brought into the world, but taken from reality. It is as though the world itself wanted to tell us something. Today, Serbian filmmaker and Film researcher Vladimir Sojat spoke at Malmö University under the title “working class on film.” The lecture was very interesting and brought a lot of thoughts in me. I would argue that Marx’s description of the sign on the factory gate is a metaphor. What is happening in production is not unknown. However, it is an ideological prohibition. Reproduction of capitalist production conditions requires simply that – what really happens in production – the exploitation of the working class – is kept secret. Therefore, the dominant aesthetic ideologies point out that production is not a legitimate object of aesthetic design. The result is (mostly) in simplified depiction in films of an ambition to direct a gaze towards the place where the classes constituted.